Traditionally on Mother’s Day, you let Mom decide everything – where to go, what to eat, what to do. It’s her one big day to do absolutely anything she pleases, and we all go along with it as happy as clams. But this year in my house, my mother opted out of decision-making. She didn’t want to help me pick a recipe for breakfast, or dinner or dessert either. She didn’t want to plan a schedule, and she didn’t want the responsibility of a single decision. So it was up to the rest of us to plan this stellar day, and it was my job to start with the breakfast. I’d found a recipe online with beautiful photos that looked pretty yummy, so I got all of the ingredients and was super excited to get up and whip it together. But late Saturday night, I decided maybe I’d read the bakers review of this particular recipe, and it was then, at about 10 minutes to midnight that I realized the dish was described as “completely mediocre.” And really, who makes mediocre things for their mother on mother’s day? Or ever, really? So I burned the midnight oil and scoured the internet for something to make, finally deciding on a chocolate crepe recipe I’d made before, and a ricotta filling of my own creation. I was going for strong visual appeal, and figured I couldn’t go wrong with the flavors. The crepe batter was thicker than I remembered it; so after it’s chill in the fridge (which was a bit too long – perhaps that’s why it was so thick?) I gave it a hefty splash of extra milk, and it was good the go. The batter is a pale brown color from the cocoa powder, and so silky and smooth. 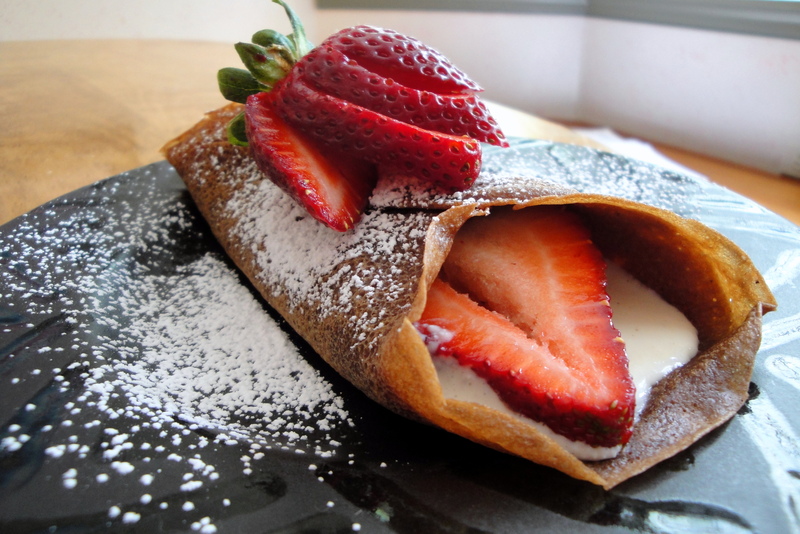 It spreads easily in the pan, and produces the most wonderful crepes. It made me look like a crepe making pro, even though I’ve only made them a handful of times before. 1) Combine the cocoa, eggs, vanilla, and coffee liquor in a large bowl until well combined. Whisk in the flour and butter and mix until the mixture is smooth and has no visible lumps. Set aside. 2) In a heavy sauce pan scald the milk (bring to a low simmer before removing from the heat). Add 1/4 of the hot milk into the egg mixture, whisking the eggs constantly to temper, then combine the remaining milk. 4) After the batter has chilled, place an 8″ non-stick omelet, saute, or crepe pan over medium heat. (I used a regular non-stick pan and it worked really well.) Spray it lightly with non-stick cooking spray. 5) Pour about 1/4 cup of batter into the center of the hot pan and swirl the pan until the batter coats the pan evenly. Cook until the edges release from the pan and the underside of the crepe slides easily in the pan, about one minute. Flip the crepe, or turn over with a rubber spatula, and cook for 30 seconds to 1 minute on the second side. 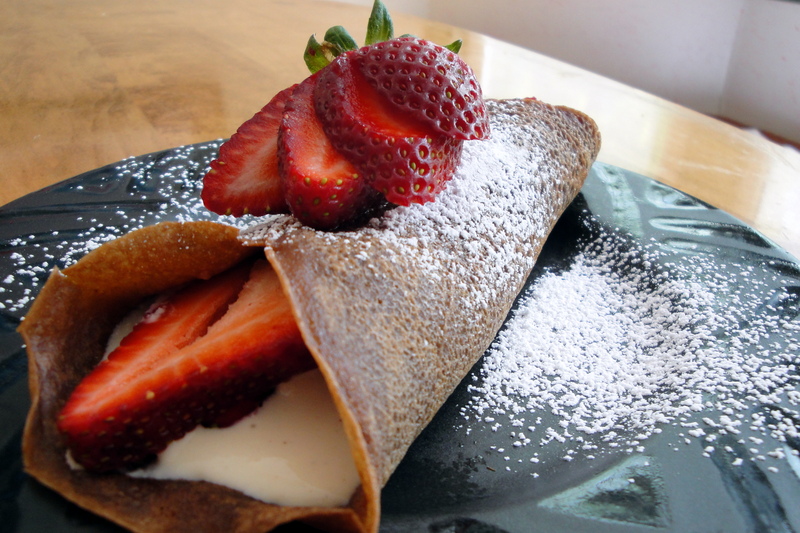 6) Remove to a plate and stack the cooked crepes between layers of parchment or wax paper. As for the filling, I looked at a whole bunch of recipes online to get a few ideas, and ultimately settled on making a cream cheese and ricotta mixture, with a few extra additions. I put in some vanilla, nutmeg (fresh ground, so it was visible in the cream and looked really cool), cinnamon and a splash of coffee liqueur because that’s included in the crepe base. (All of the amounts below of an estimation of what I used, so definitely add them to taste!) However, I’d have added more of everything I think, just so that the flavors had come through more. 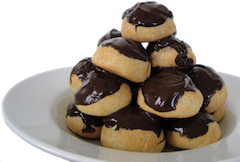 Any maybe omitted the coffee liqueur, because the filling doesn’t need the extra moisture. Also, if you made plain crepes, the filling would be absolutely fabulous with some freshly grated lemon zest. I assembled them with cream on the bottom, a very generous layer of fresh strawberries, and a dusting of powdered sugar. When I presented them to my mother, she seemed quite pleased. And the pleasure only continued after we gobbled down a couple each. What a way to start the day! 2) Add the confectioners sugar slowly, until it is completely incorporated and the mixture is smooth. 3) Add each of the remaining ingredients, and stir to combine. Chill until ready to serve. 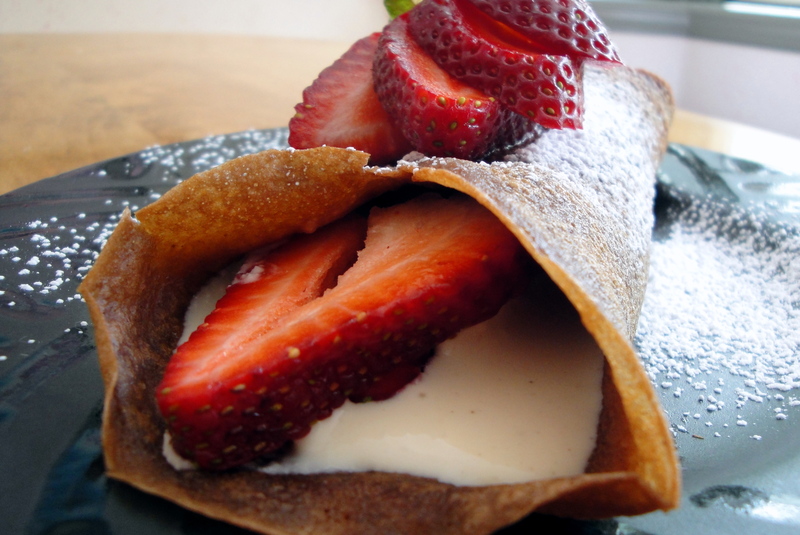 Once assembled, these crepes look absolutely stunning, and they are a well-balanced combination of flavors. 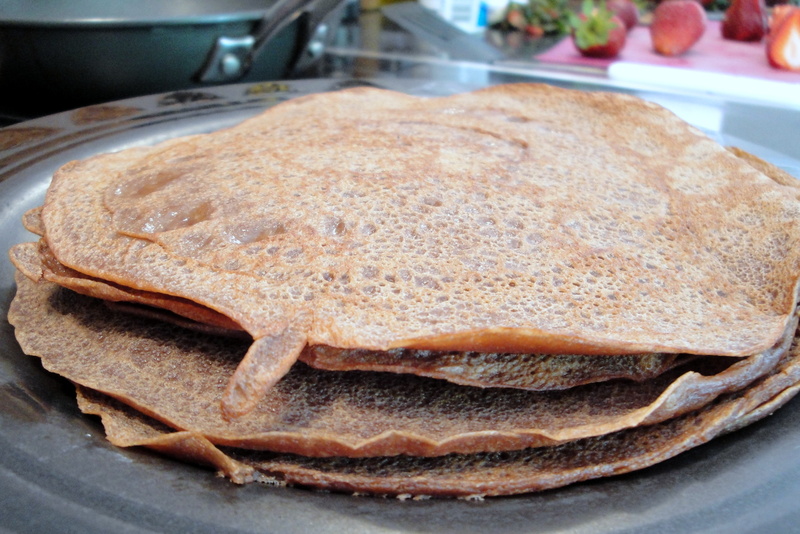 The chocolate crepes have a rich cocoa flavor, and the silky cheese mixture is light, and not too sweet.. The strawberries are a little bit tart, a little bit sweet, so they go perfectly with the rest of the flavors. With our second round of crepes, we added a layer of blackberry jam spread inside of the crepe before we slathered on the cream, and it was even better. I’d imagine any fruit jam – particularly a berry jam – would go well in these crepes. 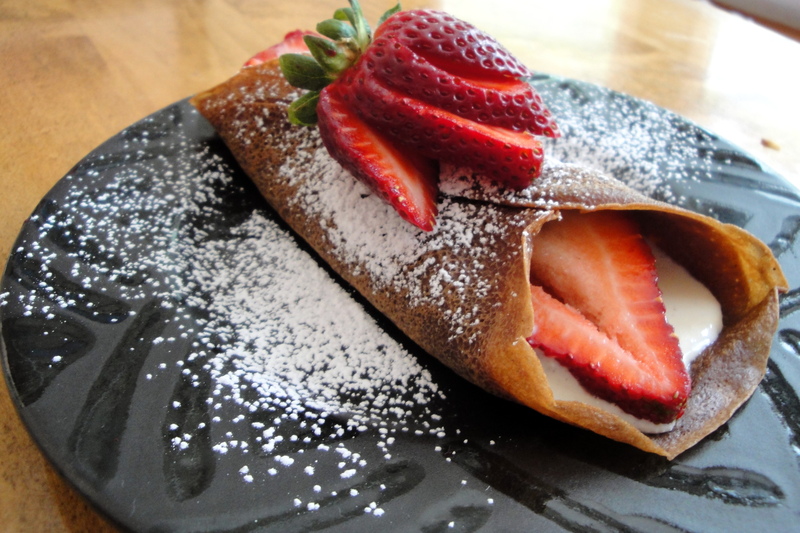 The original recipe I used to make these crepes the first time was from Evil Shenanigans. The recipe was for Banana and Chocolate Mascarpone Crepes, so be sure to give that a whirl too – they are absolutely incredible.